I hope everyone is getting a good view of the eclipse. It started off clear in Chelmsford but there is quite a bit of drifting cloud now coming in from the east. Here's a shot taken just at the start of totality. This is 10s, ISO400, C6 at f/6.3. Nick. In the end it was clear all the way through from Chelmsford with only a few drifting clouds. This timelapse shows the eclipsed moon moving in front of the background stars during totality. Even in total eclipse the moon is still very bright compared to the stars so it is overexposed here but it shows just how quickly the moon moves. Thanks Nick. Good conditions here in Sheffield too. The leading edge of the umbral shadow was grey in colour, but the following shadow was copper-coloured and quite dark. Nevertheless, major surface features (e.g. Tycho, Plato, Sinus Iridum and Aristarchus) remained visible throughout as seen through an 80mm ED refractor and my 300mm OMC. During totality the Moon appeared 3D in its star field at low powers through the 80mm OG - a stunning sight. 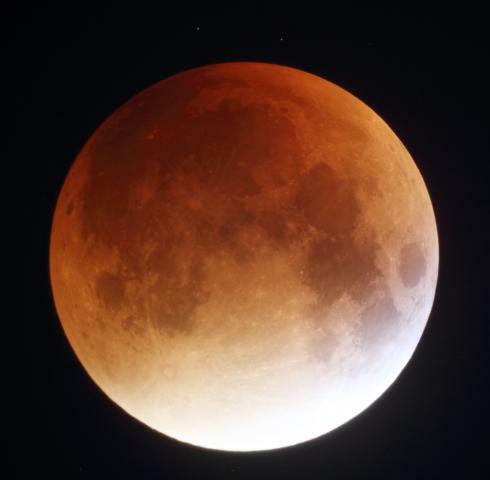 The colour of the umbra during totality was copper-grey, with the southern limb much brighter. For a time around mid-eclipse the copper colour almost disappeared and the eclipsed Moon appeared grey. Overall, I found this to be a moderately dark eclipse, with the reddish colours rather subdued. I would estimate it at II or I on the Danjon scale, as seen from the Sheffield suburbs. The total phase ended at about 03.22 UT, with third umbral contact at the limb near Schiller. Hope others enjoyed it too. I'd be glad to receive any reports and images. Here in Thorpe-le-Soken, (east coast) not far from Nick in Chelmsford, the only cloud was at the start of the partial phase where the first 4 minutes were missed. There was some concern at the end of totality, but the cloud melted away almost as soon as it had formed. I found the eclipse very dark (other than the bright southern - IAU - limb). Being colour blind I tend not to comment on colour but my wife, who observed the eclipse with me, thought it ranged from brown to grey to tarnished silver to the colour of dirty washing up water (is that a new colour term?. I continually asked her if it looked red or copper coloured but she said no. I observed naked eye and with 10x50 bins and even with bins was unable to see Aristarchus. During totality the Milky Way was very obvious as was a naked eye Messier 31. Whereas most birds go quiet during a total solar elclipse I was surprised how much noise a pair of Tawny Owls made during totality. I often hear owls when out observing, but never making this much noise. All in all an excellent eclipse. A lovely capture. Well done. I found it was quite hard to get the settings correct on the camera as either the remaining illuminated arc was too bright, or the rest of the Moon was too dark - you seem to have got a good balance. Nice work. It was well worth staying up late for. In Wiltshire, not far from Salisbury Plain, there were some tasteful high altitude wisps of cloud before the penumbral stages, but by the time the eclipse was underway they had mainly melted away leaving a clear, if not very transparent, sky. As the night went on and the temperature dropped to 3C some mist started to form, but this was mainly near watercourses. Pretty nearly ideal conditions. A dark eclipse with an orange tinge. If my blood looked that colour, I would see a doctor quick! I didnt think any colour was apparent until the umbral phases. Is that the general perception or is my colour vision poor? Fabulous image Nick! I could not face an all nighter, but I did get up for about 20 minutes from 3:10am. Your image has very faithfully captured the colours. Nice. I think that will do for the Christmas card. I did something similar with mine but it is not as nice as yours since I didn't get my shots evenly spaced.